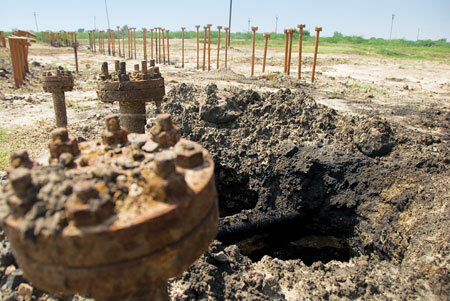 Oil wells fitted with pumping devices are a common sight in Mehsana district, north of Ahmedabad. For the state-run Oil and Natural Gas Corporation (ONGC) the district is the most prized onshore oil asset in India, producing about 40,000 barrels crude oil a day. But for farmers the wells spell ruin. The sludge and dirty water that the wells spurt at the time of drilling find their way into adjoining farms. The old underground pipelines that carry oil from the wells to storage stations leak oil into the fields, destroying crops. Pools of oil, grease and water can be seen in ONGC’s Viraj oil fields in Kadi taluka. In August this year, leaked oil from a pipeline spread to 46 hectares in Jaidevpura village after monsoons, said Sukhdev Patel, a farmer. When people complained, they covered the sludge with sand. “Nothing grows where the oil spills; standing crops die instantly. The committee ONGC has formed to survey the contamination and take corrective measures is yet to visit,” said Dalsukh Hirabhai Venkat, a farm worker. The first oil well in Jaidevpura was bored 30 years ago. Since then, whenever leaked oil has spread into farms, ONGC has paid compensation. The current rate of compensation is Rs 100 per square metre. Additional sum is given for destroyed crops. A small settlement in Kadi town is affected by ONGC’s well number 59. The discarded mixture of water and oil from the well formed a large pool near the settlement over 20 years ago. It was filled with mud and decontaminated in 2006. But when the well was unclogged using drilling equipment, there was a new pool of sludge. “After the monsoon this year, we have a dirt pond as big as the previous one,” said Viraji Bhai, a resident. The pungent smell from the sludge pond has become a constant in the lives of the residents. 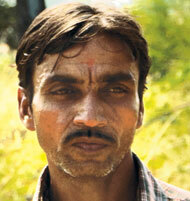 There are no ill health effects on them as they get their water supply from the Narmada canal. The dirty water attracts birds. Nisha Dashrath, a daily wage farm worker, said her clothes are dirtied by birds that visit the pond and then sit on the clotheslines. Cattle and dogs too spread the mess around. Leakages are unavoidable as some of the pipelines have been in use for 50 years, said Ram Avatar, executive director of ONGC’s Mehsana asset or division (the divisions do not coincide with district boundaries). Officials said contamination near wells are treated on-site (see ‘Oil eating bacteria’). In the case of farms, the excavated soil is treated off-site and replaced with fresh soil so that the farmer can go on working without waiting for the cleaning process to be completed, said Banwari Lal, chief of ONGC-TERI Biotech Limited (OTBL), the joint venture company set up by ONGC and The Energy Research Institute(TERI) to undertake soil remediation. Mehsana has 1,100 oil wells that are in use. ONGC introduced soil remediation using bacteria in 2006 after the Comptroller and Auditor General pointed out that compensation amounts paid to farmers are a burden on the public exchequer and cleaning options should be explored. Compensation paid to farmers between 2007 and 2010 was Rs 8.2 crore in Mehsana asset and Rs 2.9 crore in the Ahmedabad asset. Manish Dwivedi, coordinator with OTBL, said a combination of microbes are used to decontaminate soil. “The mixture is called Oil Zapper. It just accelerates the process of breaking down oil,” he said. Residents living near ONGC’s well 59 in Kadi town said bioremediation has not proved successful in their area. 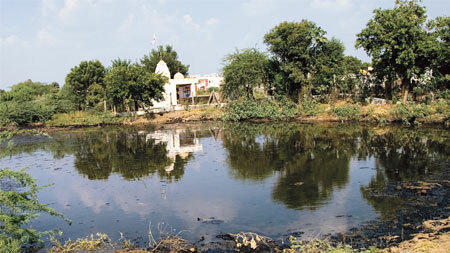 The cleaned pond is displayed on the website of OTBL (see pics below). A visit to the site revealed the pond was there and looked as dirty as in the ‘before treatment’ picture on the website. OTBL chief Lal said the site was cleaned. “If there is sludge at the site, it must be from recent leakage,” he added. To prove the efficacy of bioremediation, OTBL cited the instance of an abandoned oil well and storage pit in Jotana and Santhal villages in Mehsana. “The area around the abandoned well is now a fish pond which shows biodiversity has returned,” said S S Patidar, environment officer with ONGC’s Mehsana asset. “ONGC is remediating its own well sites first. We will start on-site remediation on private land of farmers in February next year,” said Karna Pal Verma, senior ONGC official. A political leader in Kadi said bioremediation is not being done properly; oil has spurted back in summers as it expands and spreads with rising temperature. Officials accused the farmers of hampering cleaning operations. They said sometimes farmers deliberately puncture pipelines to claim compensation. The compensation for crop is assessed separately from compensation for contaminated land. If the crop destroyed is zeera (cumin), which has a good premium, the compensation would be higher. “Farmers’ resistance is a big problem. There are people who have built bungalows on this compensation amount and they are creating obstacles in the clean-up process,” alleged Lal. 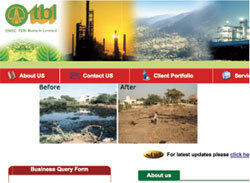 OTBL has spent Rs 13.71 crore on bioremediation since 2006 in its Ahmedabad asset where Viraj oil fields are located. ONGC officials said Central Industrial Security Force personnel have been posted every six kilometre along the trunk pipes to track leakages. Sukhdev Patel of Jaidevpura village admitted there are instances when people pay commission to company officials to get higher compensation. But there is no solution to gradual destruction of farmlands, said Patel. When they drill for oil, dirty water comes out first. This water is corrosive and released into pipelines of abandoned wells from where it finds its way into fields. Manilal a farmer of Jaidevpura said his nearly one hectare farm was destroyed this way. He has stopped farming for five years. ONGC officials said the effluent that comes out along with gas and crude oil is treated. “It is mostly saline water, oil and grease. We dispose of the treated water a kilometre below ground and never on the surface. So there is little scope of contamination due to that,” said Patidar. Great investigative article. This clearly belies the claim of ONGC's green credentials and TERI's effectiveness of oil zapper, a product from which it is raking huge money from the exchequer with hardly any accountability. If such nexus goes on between supposedly 'green NGOs' and public sector organisations - each patting the others back, one wonders whether anybody cares about conflict of interest in the country and how seriously such unilateral claims should be taken. Kudos to the DTE reporting team. Thanks for the appreciation Uma. it motivates us a lot! However, I just want to say that we are not doubting the efficacy of oil zapper. It may be a good product if used properly, but that is not happening probably. i also found the effectiveness of the oil eaters, but i still interested in the much more efficient consortia and faster bio remediation technology to be researched and also wants to work for that. so if any project is related to that i will be very grateful to work for that.